When the Kansas Legislature convenes in January, one-third of the seats will be filled by someone new. The election results show that many voters recognized the serious financial trouble in Kansas and now expect a change in direction. But will they get it? Lawmakers face a daunting task. To successfully alter the situation, they must take a big risk and do something that does not come naturally to politicians — gather a bipartisan coalition and reform the tax system to raise revenue. State finances have so soured that the current budget sunk $350 million underwater even after record amounts were taken out of the highway fund and large spending cuts were unceremoniously applied to universities and Medicaid providers. This leaves Kansas schools and other key state services highly vulnerable to another round of debilitating cuts. Kansas simply does not have enough revenue to pay even a constrained set of bills. The 2012 income tax cuts unbalanced the Kansas budget from the moment of implementation, but the situation has become especially dire today because lawmakers emptied reserves and exhausted other one-time budget maneuvers in earlier efforts to patch up the budget. We have few options left. Without more revenue, lawmakers must make deep cuts-to-the-bone in state programs. For those legislators who voted in 2012 to deliberately starve the state’s revenue stream in order to downsize government, this is a happy climax. But that group lost heavily in the elections. In the 2017 Legislature, moderate Republicans and Democrats now have enough numbers in each chamber to pass policy changes, if they work together. But forming coalitions becomes challenging whenever there’s hard medicine to swallow. 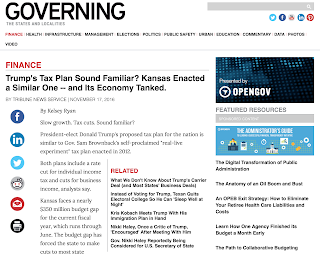 Kansas lawmakers will face headwinds as the Trump administration and a Republican Congress attempt to pass the very kind of tax legislation on a national scale that Kansas seeks to undo here. Then, even if tax policy changes pass the Legislature, the governor may not sign the bill. But despite the barriers, lawmakers must forge ahead because the stakes for Kansas are enormous. The financial sickness will not heal up on its own without corrective action. One obvious step forward would close the LLC loophole which allows business income to go untaxed. The recent Kansas Speaks survey showed that 61 percent of Kansans support this action. Some lawmakers may be tempted to do only this and declare victory, but that alone will not fix the budget. At a minimum, lawmakers must make revenue equal expenses, which requires ending the LLC loophole as well as enacting a package of other financial corrections. Reducing sales tax on food as part of this package — as some lawmakers propose to do — would require further upward adjustments to balance the cost. Can lawmakers work across party lines to enact change? Will the governor sign a bill rescinding at least a portion of the 2012 tax cuts? Unless the answer to both questions is “yes,” the financial suffering of Kansas will worsen, plunging our state into a further downward spiral.